Sehr viele gute Songs neben dem "Smash Hit" Budapest, zwei Ausfälle und zwei so lala Songs trüben den Gesamteindruck. Unglaublich, dass George kein älterer Mann ist. Nachtrag: angesichts des genialen Bonus-Tracks "Da Vinci Riot Police" erhöhe ich doch noch: 4 => 5. Nachdem sich "Budapest" allmählich zu einer unwiderstehlichen Ohrwurm-Nummer gemausert hat, musste natürlich auch das Album gecheckt werden, und dieses hat noch allerhand weitere Perlen zu bieten, die allesamt vom Georges reifer Stimme getragen werden. Die flotteren Nummern mag ich zwar etwas mehr als die ruhigeren Stücke, und doch gibt es kaum Schwächen auf dem Album, höchstens ein paar eher durchschnittliche Songs, die aber auch im grünen Bereich liegen. Besonders erstaunlich die Elvis-artige Nummer "Cassy O'", das zunächst ruhige und dann rockige "Did You Hear The Rain?" oder auch der großartige Bonustrack "Da Vinci Riot Police", um nur ein paar Highlights zu nennen. Ein beachtliches Debüt von George Ezra, der uns hoffentlich länger erhalten bleibt! When I first heard 'Budapest' I thought he was something different and fresh so rushed out and bought the album. Unfortunately only one other track stands up with it on this pretty underwhelming but in another way solid debut. Highlights were of corse the delightful 'Budapest' and 'Leaving It Up to You". I remember being annoyed at his voice when I first listened to Budapest and I wasn't too sure how I was going to enjoy this. Budapest is something I have come to love and enjoy but Blame It On Me doesn't do much, despite it being a hit right now. But listening to this, I can actually say that I really like George Ezra, he performs well, his vocals are great and versatile and he writes a nice song. I think he is very different to anyone around at the moment, his voice carries so much emotion, while it's not technically perfect it is so soulful and rich. I really enjoyed this, a lot more than I thought I would, and I'm excited to see what he releases next. 4.4/6 rounded up. Die Stimme von George Ezra ist für sein Alter schon aussergewöhnlich. Aufgerundete fünf Punkte sind verdient. A quite enjoyable album which I haven't tired of. It's a good album. 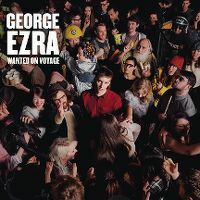 Not a strong compatibility yet but it gives George Ezra's image a great appreciation. His vocals sounds very nostalgic reminds me of the classic rock artists like JJ Cale. Some of the tracks are deeper and keeps it shallow to slowly finish the whole album. Which is why I give it a 4 star. But asides from that there are some really great ones on there. "Budapest" is my jam and also my favourite that is growing on me. When I first heard that song I thought to myself "Oh god this is going to be annoying!". But is actually not lol. "Listen To The Man", "Barcelona" "Cassey-O" and "Stand By Your Gun" are my favourites. Although, the deluxe tracks are a bit boring and lacks cohesion quick. But I can't name the tracks though but "Da Vinci Riot Police" stands out good. I would love to hear this album again because I like rock and I would definitely see if he is going to keep his compatibility stronger for his next album.